The Marvelous Mrs. Maisel has some new company. Deadline reports Kevin Pollak, Bailey De Young, Joel Johnstone, and Caroline Aaron have joined the Amazon TV series. 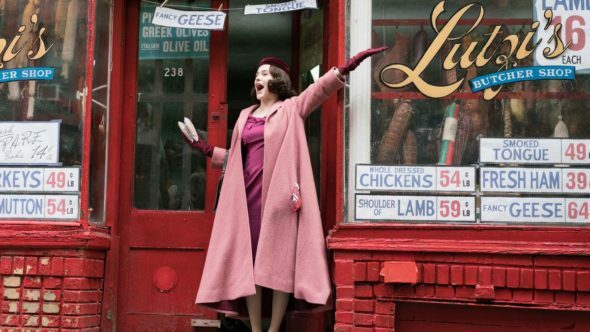 From Gilmore Girls creator Amy Sherman-Palladino, the dramedy follows Miriam “Midge” Maisel (Rachel Brosnahan), a 1950s housewife who begins a career as a stand-up comic. Amazon has already picked up the series for two seasons. What do you think? Do you subscribe to Amazon Prime? Will you watch The Marvelous Mrs. Maisel? More about: Amazon TV shows: canceled or renewed?, The Marvelous Mrs. Maisel, The Marvelous Mrs. Maisel: canceled or renewed? The Marvelous Mrs. Maisel on Amazon: Cancelled or Renewed for Season Three? The Marvelous Mrs. Maisel: Is the Amazon TV Show Cancelled or Renewed for Season Two? The look show like some thing ok I sill will not watch it ! Very good, looking forward to watch.